Raytheon Co., Integrated Defense Systems, Marlborough, Massachusetts, is awarded a $402,658,015 fixed-price-incentive (firm target) modification to previously-awarded contract N00024-14-C-5315 to exercise options for Air and Missile Defense Radar Program (AMDR) Low-Rate Initial Production (LRIP). This modification will provide for three AMDR LRIP units. The LRIP units will be deployed on DDG-51 Flight III-class ships. Work will be performed in Marlborough, Massachusetts, and is expected to be completed by March 2023. Fiscal 2019 shipbuilding and conversion (U.S. Navy) funding in the amount of $402,658,015 will be obligated at time of award and will not expire at the end of the current fiscal year. The Naval Sea Systems Command, Washington, District of Columbia, is the contracting activity. AN/SPY-6(V) is the U.S. Navy’s next generation integrated air and missile defense radar. Currently in production, and on track for the DDG-51 Flight III destroyer, SPY-6 provides the Navy with unmatched protection against air, surface, and ballistic missile threats. The radar is built with individual ‘building blocks’ called Radar Modular Assemblies (RMA). Each RMA is a self-contained radar in a 2’×2’×2’ box. These RMAs can stack together to form any size array to fit the mission requirements of any ship. This technology makes SPY-6 the Navy’s first truly scalable radar. Gallium Nitride-based AESA – semiconductor technology enables 360 degree Active Electronically Scanned Array capability. The U.S. Navy successfully conducted a simultaneous Air and Ballistic Missile Defense (BMD) flight test with the AN/SPY-6(V) Air and Missile Defense Radar (AMDR) off the west coast of Hawaii, September 7. At 1:38 p.m., Hawaii Standard Time, (7:38 p.m. Eastern Daylight Time) a short-range ballistic missile target and multiple air-to-surface cruise missile targets were simultaneously launched. AN/SPY-6(V) AMDR searched for, detected and maintained track on all targets throughout the trajectories. The flight test, designated Vigilant Talon, is the third in a series of ballistic missile defense flight tests for the AN/SPY-6(V) AMDR. «This radar was specifically designed to handle ballistic missiles and cruise missiles simultaneously, and it’s doing just that», said Captain Seiko Okano, major program manager for Above Water Sensors, Program Executive Office (PEO) Integrated Warfare Systems (IWS). «AMDR is successfully demonstrating performance in a series of increasingly difficult test events and is on track to deliver advanced capability to the Navy’s first Flight III Destroyer». Based on preliminary data, the test successfully met its primary objectives against a complex short range ballistic missile and multiple air-to-surface cruise missile simultaneous targets. Program officials will continue to evaluate system performance based upon telemetry and other data obtained during the test. The culmination of over a decade of U.S. Navy investment in advanced radar technology, AN/SPY-6(V) AMDR is being designed for the DDG-51 Flight III destroyer to provide the U.S. Navy with state-of-the-art technology for Integrated Air and Missile Defense. PEO IWS, an affiliated PEO of the Naval Sea Systems Command, manages surface ship and submarine combat technologies and systems and coordinates U.S. Navy enterprise solutions across ship platforms. The U.S. Navy successfully conducted another Ballistic Missile Defense (BMD) flight test with the AN/SPY-6(V) Air and Missile Defense Radar (AMDR) off the west coast of Hawaii, July 27. At 2:05 p.m., Hawaii Standard Time (8:05 p.m. Eastern Daylight Time) a medium-range ballistic missile target was launched from the Pacific Missile Range Facility at Kauai, Hawaii. AN/SPY-6(V) AMDR searched for, detected and maintained track on the target throughout its trajectory. The flight test, designated Vigilant Titan, is the second in a series of ballistic missile defense flight tests for the AN/SPY-6(V) AMDR. «We are continuing to stress this radar by increasing the range and complexity of the targets and demonstrating the awesome capability and versatility of the Navy’s next generation Integrated Air and Missile Defense radar». said Navy Captain Seiko Okano, major program manager for Above Water Sensors, Program Executive Office (PEO) Integrated Warfare Systems (IWS). «AN/SPY-6 is the nation’s most advanced radar and will be the cornerstone of the U.S. Navy’s surface combatants for many decades». Based on preliminary data, the test successfully met its primary objectives against a complex Medium Range Ballistic Missile (MRBM) target. Program officials will continue to evaluate system performance based upon telemetry and other data obtained during the test. 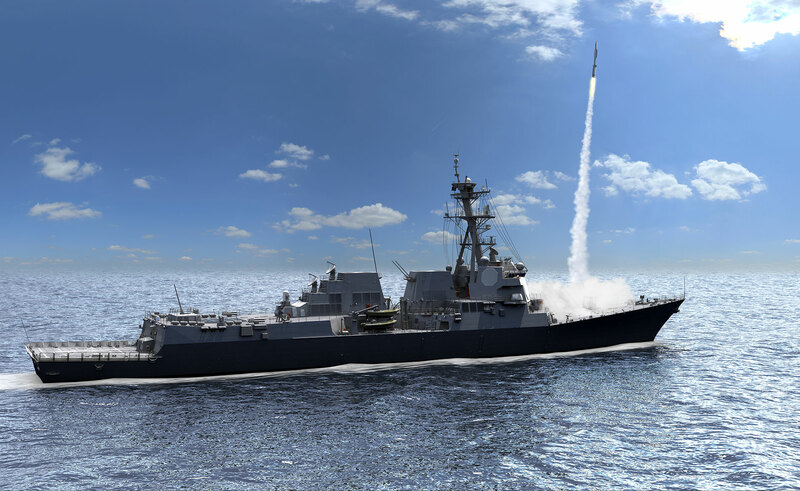 The culmination of over a decade of Navy investment in advanced radar technology, AN/SPY-6(V) AMDR is being designed for the DDG-51 Flight III destroyer to provide the U.S. Navy with state-of-the-art technology for integrated air and missile defense. PEO IWS, an affiliated PEO of the Naval Sea Systems Command, manages surface ship and submarine combat technologies and systems and coordinates Navy enterprise solutions across ship platforms. Raytheon Company is being awarded a $327,146,998 Fixed Price Incentive (firm target) modification to previously awarded contract N00024-14-C-5315 to exercise options for Air and Missile Defense Radar Program (AMDR) Low Rate Initial Production (LRIP). «Progressing to production is the result of a lot of hard work and dedication from our AMDR team of experts across Raytheon, the U.S. Navy, and our world-class suppliers. In just over three years of the Engineering, Manufacturing and Development phase, we’ve gone from a technology demonstrator to a technically mature, highly advanced, functioning radar», said Raytheon’s Tad Dickenson, director of the Air and Missile Defense Radar program. «Production begins today – which brings us one day closer to delivering this needed, and unprecedented, integrated air and missile defense capability to the U.S. Navy». Raytheon’s decades of radar development and manufacturing expertise is driven by proven infrastructure and a highly experienced workforce. The company’s 1.4 million square foot production facility in Andover, Massachusetts is a center of excellence for vertically-integrated, highly complex manufacturing with flexible work flow supporting all phases of product development from testing to full production. Scalable to suit any size aperture or mission requirement. Over 30 times more sensitive than AN/SPY-1D(V) in the Flight III configuration. Designed to counter large and complex raids. Adaptive digital beamforming and radar signal/data processing functionality provides exceptional capability in adverse conditions, such as high-clutter and jamming environments. It is also reprogrammable to adapt to new missions or emerging threats. All cooling, power, command logic and software are scalable. Designed for high availability and reliability, AMDR provides exceptional capability and performance compared to SPY-1 – and at a comparable price and significantly lower total ownership cost. AMDR’s performance and reliability are a direct result of more than 10 years of investment in core technologies, leveraging development, testing and production of high-powered Gallium Nitride (GaN) semiconductors, distributed receiver exciters, and adaptive digital beamforming. AMDR’s GaN components cost 34% less than Gallium Arsenide alternatives, deliver higher power density and efficiency, and have demonstrated meantime between failures at an impressive 100 million hours. AMDR has a fully programmable, back-end radar controller built out of commercial off-the-shelf (COTS) x86 processors. This programmability allows the system to adapt to emerging threats. The commercial nature of the x86 processors simplifies obsolescence replacement – as opposed to costly technical refresh/upgrades and associated downtime – savings that lower radar sustainment costs over each ship’s service life. AMDR has an extremely high predicted operational availability due to the reliable GaN transmit/receive modules, the low mean-time-to-repair rate, and a very low number of Line Replaceable Units (LRU). Designed for maintainability, standard LRU replacement in the Radar Modular Assemblies (RMA) can be accomplished in under six minutes – requiring only two tools. The Radar Suite Controller (RSC) – a new component to manage radar resources and integrate with the ship’s combat management system. Raytheon Company delivered the first AN/SPY-6(V) Air and Missile Defense Radar (AMDR) array to the U.S. Navy’s Pacific Missile Range Facility in Hawaii ahead of schedule. The array is now being installed according to plan, in preparation for first radar light-off in early July. SPY-6(V) is the next-generation integrated air and ballistic missile defense radar for the U.S. Navy, filling a critical capability gap for the surface fleet. This delivery is the latest in a series of milestones achieved on time or ahead of schedule, as SPY-6(V) advances through the Engineering and Manufacturing Development (EMD) phase, which is now close to 80 percent complete. In less than 30 months, the SPY-6(V) array completed design, fabrication and initial testing. Soon to transition to Low Rate Initial Production (LRIP), SPY-6(V) remains on track for delivery in 2019 for the first DDG-51 Flight III destroyer. 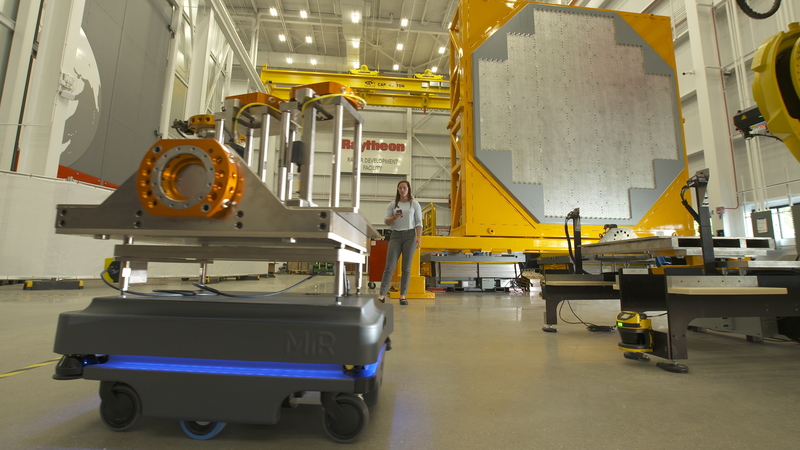 «Several months of testing at our near-field range facility, where the array completed characterization and calibration, have proven the system ready for live target tracking», said Raytheon’s Tad Dickenson, AMDR program director. «The array was the last component to ship. With all other components, including the back-end processing equipment, delivered earlier and already integrated at the range, AMDR will be up and running in short order». «The extensive testing to date has demonstrated good compliance to the radar’s key technical performance parameters», said U.S. Navy Captain Seiko Okano, major program manager, Above Water Sensors (IWS 2.0). «The technologies are proven mature and ready for testing in the far-field range, against live targets, to verify and validate the radar’s exceptional capabilities». SPY-6(V) is the first scalable radar, built with RMAs – radar building blocks. Each RMA (Radar Modular Assembly), roughly 2′ × 2′ × 2′ in size, is a standalone radar that can be grouped to build any size radar aperture, from a single RMA to configurations larger than currently fielded radars. All cooling, power, command logic and software are scalable, allowing for new instantiations without significant radar development costs. Providing greater capability – in range, sensitivity and discrimination accuracy – than currently deployed radars, SPY-6(V) increases battlespace, situational awareness and reaction time to effectively counter current and future threats. Designed for scalability, reliability and ease of production, SPY-6(V) incorporates innovative and proven technologies, including RMAs, digital beamforming and Gallium Nitride (GaN), to offer exceptional radar capabilities to fit any ship for any mission. 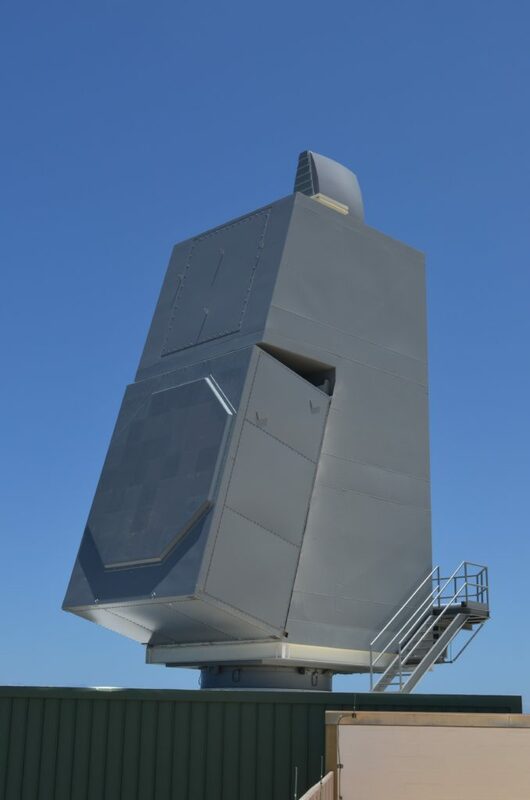 Raytheon Company announced its AN/SPY-6(V) Air and Missile Defense Radar (AMDR) team has completed the first full radar array, fully populated with component Line Replaceable Units (LRUs), including more than 5,000 Transmit/Receive elements, in 140 days. In less than two years, the AMDR radar has been designed, built and transitioned to test; the Engineering and Manufacturing Development (EMD) phase of the program is now more than 66 percent complete. The program remains on track to begin production and deliver on time to the FY16 authorized DDG-51 Flight III destroyer. «As each milestone is completed, development of the SPY-6 radar progresses on schedule», said U.S. Navy Captain Seiko Okano, major program manager, Above Water Sensors (IWS 2.0). «With this array, now built and operational in the Near Field Range, we are proceeding to plan and commencing full-scale integration and test of AMDR’s unprecedented capability». Subcontractor Major Tool and Machine delivered the array structure to Raytheon’s Near Field Range on July 29; and Raytheon installed all passive RF components before September 1. The first Radar Modular Assembly (RMA) was powered up in October and testing began. All RMA chassis were installed by October 16, complete with cooling, power, fiber-optic control and data interfaces. In 79 days the array infrastructure was complete – verification of the simplicity of the AMDR array design. Population of the array with Transmit Receive Integrated Multi-channel Modules and Distributed Receiver/Exciter LRUs completed on December 16. 95% of EMD hardware production is complete; awaiting final power systems delivery in early 2016. «Our solid performance leverages our high-power AESA radar and digital beam-forming expertise and our collaborative partnerships with the U.S. Navy and a network of dedicated suppliers», said Tad Dickenson, Raytheon’s AMDR program director. «Benefits in productivity, quality and affordability continue to be realized as a result of our mature Agile development methodology. In fact, the AMDR software development team achieved a greater than 99 percent pass rate at system test, all driven by Agile processes for early and incremental testing and defect identification». SPY-6(V) is the next-generation integrated air and ballistic missile defense radar for the U.S. Navy, filling a critical capability gap for the surface fleet. It is the first scalable radar, built with RMAs – radar building blocks. Each RMA, roughly 2′ × 2′ × 2′ in size, is a standalone radar that can be grouped to build any size radar aperture, from a single RMA to configurations larger than currently fielded radars. All cooling, power, command logic and software are scalable, allowing for new instantiations without significant radar development costs.